I'm too busy. It's cold out. I won't meet my article deadline. I say these things to myself when I don't feel like going to the gym. Yep: we humans are great at creating excuses when we don't want to do something. Below, meet three women who had their own excuses for not changing their diets... until one day, they did -- and doing so changed their lives. Happy World Vegan Month! 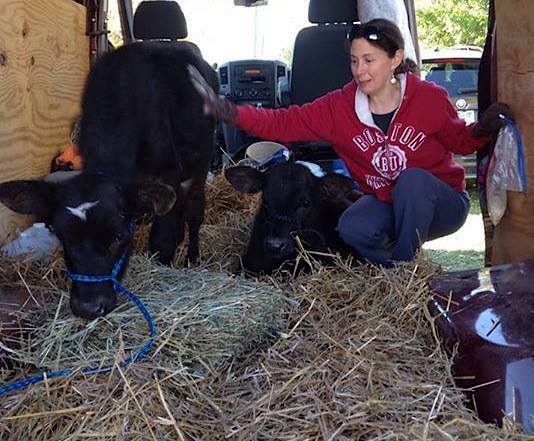 Fully committed to veganism, Sande writes a vegan column for the Poughkeepsie Journal... and she rescued a dairy calf! Sande Nosonowitz of Pleasant Valley, New York, thought she had a good marriage... until her husband Stevan went vegan, too! 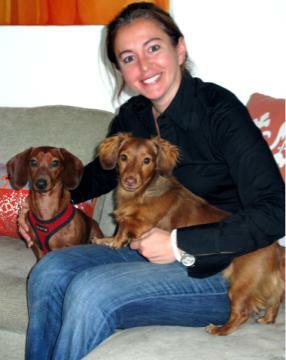 For much of her life, Sande had digestive issues. She tried "everything under the sun" to cure herelf. "I wanted to be vegetarian," she told me, "but didn't have the conviction." But three years ago, a serious injury brought Sande's life to a halt. She explained: "I had a thriving corporate yoga business and active social life, and suddenly I was in enormous pain. I had to give up my business, my yoga practice, my social activities. My life became small and isolated." Sande became virtually housebound, going out to see doctors to try to minimize the pain. When Sande meditated at home, she began to understand how oblivious to suffering she had been. "Now that I was suffering, I understood it in a new way," she says. Her beloved dog Henry stayed by her side, and Sande fell even more deeply in love with him. Gradually, she told me, everything "began to connect," and the concept of "ahimsa," or non-harming, became real for her. A yoga instructor for many years, Sande realized that she had been teaching ahimsa but not practicing it herself. "I realized I wanted NO BEING to suffer," she explains. "It wasn't just about my pain, and it wasn't just about Henry." Sande dove into research about the food industry, and was horrified by what she learned. Soon afterwards, she went vegetarian ("Veganism didn't seem realistic in a household of meat eaters"), but after a few months, she gave up dairy, too. Are you still in a "household of meat eaters?" I asked her. Sande told her husband Stevan that she couldn't shop for him anymore, and that he couldn't call himself an animal lover. "He could say he loved Henry, but that is all... I tried to help him see this." And one day soon after that conversation, Stevan simply said, "I love you. I see how passionate you are about this. But I'm not doing this for you. I'm doing this because it's the right thing to do." Sande says that Stevan's decision has transformed their lives together. "We've always been very close, but to connect on this level with something so very important has taken our marriage to a much more profound level. It is truly over the top now -- it's almost spiritual." Like many of us, Ashley Shamus of Scranton, PA, grew up as a "meat and potatoes girl." As a child, she wanted to be vegetarian, but pressure from family and friends prevailed. When she moved out of her parents' house, though, Ashley researched the lives of animals grown to feed humans. "The moment I saw the suffering with my own eyes... that was it. I was done," she said. That was six years ago. Ashley has been instrumental in her family's evolving diet. Realizing that people resist what they don't understand, she "went slowly," offering articles, information about health, recipes. She took them to Walmart to show them how economical vegan cooking can be, and her family uses Happy Cow to find the vegan-friendliest restaurants in the region. And her efforts are working. These days, her parents' home is meat-free, and her mom often sends her pictures of their dinners, boasting about things like quinoa pilaf. She recently said to Ashley, "Your dad's blood pressure is way down -- this vegan thing works!" On a personal level, the changes in Ashley's life have been profound. As a teenager, she was an incorrigible "couch potato" who suffered from many diet-related ailments, including extreme acid reflux. Ashley didn't realize that her body couldn't tolerate highly acidic meat and dairy products. She was literally was up all night, "feeling like crap after every single meal." Fast forward a few years. Not only does Ashley no longer have acid reflux -- she's training for ultra-marathons, something her friends still find hard to believe. Her secret? "I credit all my physical and mental successes to eating a clean, plant-based diet," she says proudly. Enough said. Good luck, Ashley, with your first ultra marathon! Lita Dwight of New York City grew up on "crappy" food: Count Chockula with Nestle's chocolate syrup, meat and potatoes, cream cheese, cottage cheese, Happy Meals, and "Pizza Hut on Friday nights." Lita didn't eat vegetables until college, when she discovered that if she ordered broccoli, it came smothered in Velveeta cheese. As a young attorney, Lita worked crazy hours, and food was an afterthought. She grabbed a Danish for breakfast, "tried to coast through the afternoon," then ordered in -- generally nothing healthy -- for dinner. But then a large benign tumor in her back gave her the wake-up call she needed. A naturopath prescribed a "clean" diet which, while not vegan, contained loads of vegetables. "The tumor didn't go away," Lita explained, "but I had more energy than I'd had in my entire life, and people kept telling me how wonderful I looked -- how bright my eyes were, how much my skin had improved." Always fascinated by how the body worked, Lita immersed herself in learning about the impact of diet on health. Eventually, she wound up at the Institute for Integrative Nutrition and began "eating better than I ever had." But it wasn't until she began dating a vegetarian who asked, point blank, how she reconciled her love for animals with the fact that she ate them that Lita took an honest look at herself. Her initial response was "What do you mean? There's nothing to reconcile. There's food... and I love animals. What's the problem?" But her partner's question "did something" to Lita. She began "to peek" at photos and videos of animal suffering that she'd avoided her entire life. And as her diet became increasingly vegetarian (thanks to her partner's cooking), Lita's desire to learn what was going on with the animals deepened. She began looking broadly at the impact of our diet: on the economy, on the environment, and more. Ultimately, the film Vegucated "sent her over the edge." While the documentary focuses on the journeys of three humans, it "sneaks in scenes of animal torture." Lita described what happened: "I went home and cried all night long. I couldn't believe what I'd seen, and I couldn't believe that my money subsidized this torture. I didn't want to support a system that abuses, confines, mutilates and tortures. I didn't want to support animal agriculture." That epiphany was the start of a profound life change, for while Lita still practices law on a project basis, she intends to run a vegan food company she named Wild Kitchen. Her goal? "I want to eliminate the dairy industry," she says matter-of-factly. With the help of Plant Based Solutions, she's tweaking recipes for a vegan Greek yogurt and a vegan mozzarella, and will soon be ready to send her products to food scientists for nutritional analysis. "Food is how to get to people on a broader scale. If it tastes good, people will eat it. And my mozzarella," she says with a smile, "is fabulous." The list of personal benefits from plant-based eating is long, and there is no better time to begin than during World Vegan Month! For tips and recipes, check out Compassionate Cuisine at Catskill Animal Sanctuary.